If you’re anything like the average TNW staffer then you’ll probably have a tough time keeping up with various tech and non-tech bills that flow your way each month. 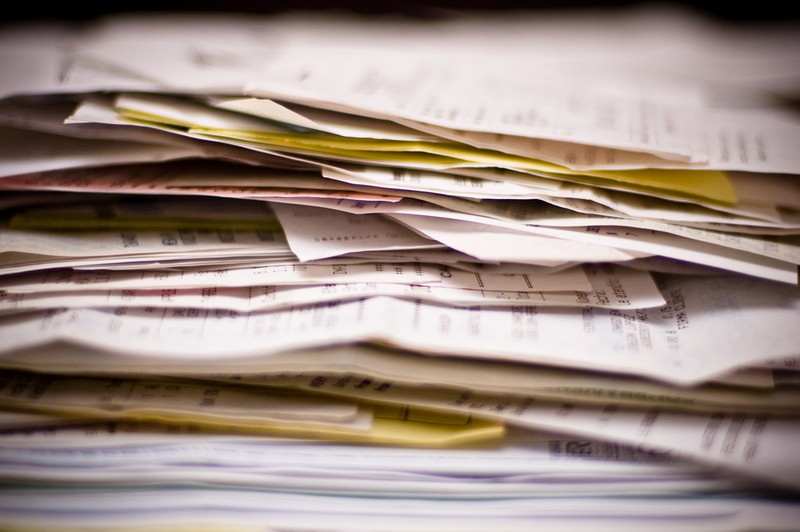 If you’re a business owner or involved in running a startup however, the chances are that these invoices roll in at a much faster and thicker rate. While conventional methods for keeping up with bills and payments generally involve offline management, a new startup is looking to make things easier than ever before. Merge Pay is that company. We first caught up with the startup at the Echelon 2012 event in Singapore in June and now, some two months later, it has come out of closed beta to allow anyone to sign up to enjoy its bill management platform. In essence, the free-to-use service promises to “track, manage, and pay for all the things you need to make running your life and your business simple” by aggregating bills, invoices and payments into its Web-based platform. The platform is fantastically straightforward and simple. Loaded bills sit on the dashboard with clear labels showing when they are due and the total recurring sum. 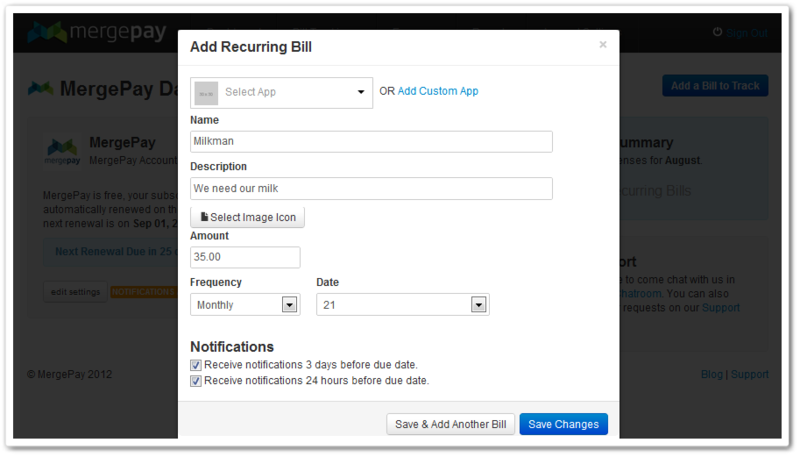 Notification settings, prices and other settings are easily edited by editing bills directly. 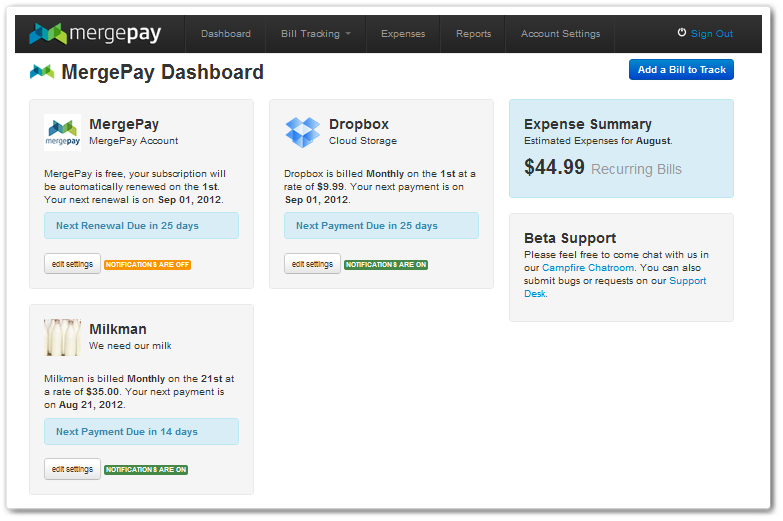 There are a number of ways to load bills, the most obvious of which is to go direct through the MergePay dashboard. Manually adding bills is straightforward and a number of popular services are pre-set into the system, making them easy to identify and add. 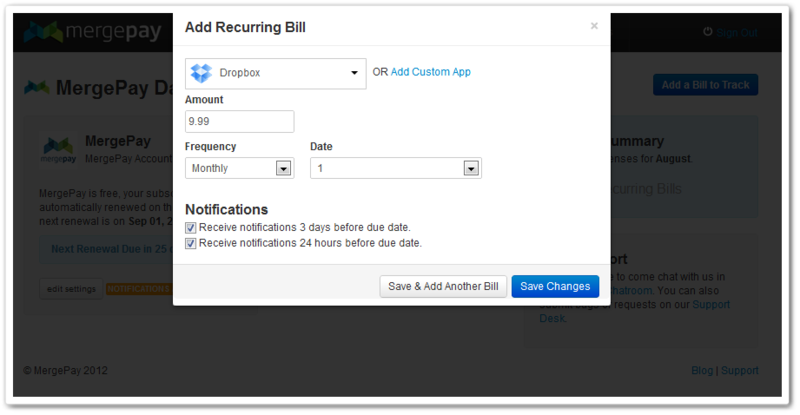 Here I’ve added a recurring bill from Dropbox. The system allows me to set the due date, price and other variables, while there is an option to receive notifications 3 days and/or 24 hours before the payment is due. Other services outside of those preset can be loaded in much the same way, using ‘Add Custom App’, and with the added bonus of adding an image. That helps keep the bills organised, and is import for the service’s analytics and reporting options, which remains in development. 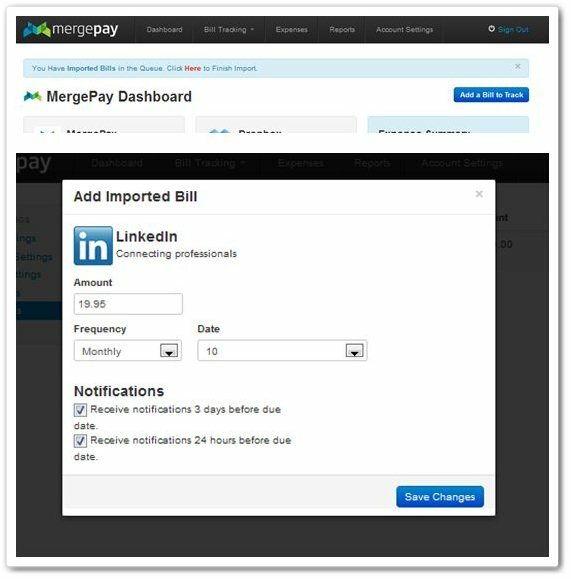 Manually entering data is all good but it is time-consuming; thankfully, there’s an easier way – bills can be forwarded to bills@mergepay.com, which will automatically import them into system. Initially forwarded emails must come from the email address used to sign up for MergePay, but there is an option to extend this functionality to other email addresses, allowing for greater flexibility. The forwarding system works well, and imported bills trigger a notification which can be opened to give a final check (and chance to tweak if needed) before the bill is loaded. On the subject of expenses, MergePay is currently testing an Expensify-like feature that will allow MergePay users to add expenses by snapping a photo of the receipt or information. He estimates that the feature will be available publicly, alongside the expenses service, within the next month or so. MergePay is free to use but anyone wanting to track more than nine bills will need to become a paid-for member, at that $9 monthly rate. Equally, bill notifications are email-based by default, but Pro users can add SMS and/or push to mobile devices if they are looking for a more prominent reminder that their upcoming bill or debit is due. Borders reveals that during the closed two month beta — which consisted of around 120 friends, family and others who got wind of it, including yours truly — an impressive 20 percent upgraded to MergePay Pro. Of that figure, the average user is tracking 30-40 bills, with the service pushing out an impressive 20-30 bill notifications each day. However, bill tracking is just the start for Thailand-based Borders, a US expat and lean startup entrepreneur, who tells me he wants to “disrupt the bill and payment space” and “remove friction” and painpoints. Borders and his team are actively working on more advanced plans to help make the service more useful and accessible, and that includes payments. Mobile apps are in development, and likely in land for iOS and Android in “a month or two”, according to Borders, but the plan goes beyond that and into the browser. A series of one click pay and track browser plugins are in development, with the aim of working in a similar way to 1Password. Essentially the plugins will allow users lean on MergePay to help make online payments easier. “On a billing page, you will be able click and enter your individual passcode which will automatically autofill your securely stored credit card details, pay, and then send that information back to MergePay to track,” the MergePay founder explains. MergePay started as an idea one afternoon, as Borders found an ongoing invoice that had slipped his radar for some time, racking up a small bill in the process, but it has continued to evolve as the American has identified other pain points and areas to move into. Right now, it is operating in a fairly under-served niche. While US banking startup Mint.com offers a bill tracking feature, but is limited to US citizens. Borders might just be on to something, and he admits that there has been firm interest in the startup since he attended Echelon. We’ll stay tuned for more as the service continue to spread its wings and add new features. You can sign up to MergePay at the link below.